You may have visited art museums before, but it’s not every day that you discover something new. That’s why we at Elmhurst Toyota wanted to let you know about the Lizzadro Museum of Lapidary Art. It’s a unique museum that appeals to adults and kids alike. You’ll find everything from jade carvings and gemstones to mosaics and fossils. If you’re not familiar with lapidary, it’s the art of cutting and polishing minerals, stones and gemstones. The Lizzadro Museum provides you with the opportunity to see an impressive assortment of rocks, minerals, stone carvings and gems from all over the world. The origins of the Lizzadro Museum of Lapidary Art go back to the 1930s. That’s when Joseph Lizzadro, an Italian immigrant who became Chairman of the Board of Meade Electric, first started to collect stones. He acquired a Chinese jade carving, intending to cut it up to make his own jade jewelry. But Joseph admired the carving so much, he couldn’t bring himself to destroy the existing work. He added new pieces to his collection, including amber agate, coral, ivory and gemstones. Joseph dreamed of opening a museum. He realized his dream on November 4, 1962, when the Lizzadro Museum of Lapidary Art opened in Wilder Park. New pieces were added to the museum’s collection right up until Joseph’s death in 1972. So, plan to visit this gem of a museum in Elmhurst. We know you’ll find some lapidary art that will inspire you! Tuesday-Saturday: 10 a.m. to 5 p.m. Admission is $5 for adults, $4 for seniors (60+), $3 for students and teens, and $2 for children under 7. Museum members and active Armed Forces members are always admitted free. Fridays are free days for everyone. Tour information and pricing are available. 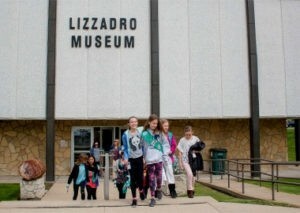 Call 630-833-1616, email info@lizzadromuseum.org or visit the museum’s website at lizzadromuseum.org.